Day 6 – why does time fly when you are having fun! Last day on the slopes. Early start – wake up at 6.30am for breakfast at 6.45 and departure at 7.20am. All well organised until Lewis declares he is only wearing one sock and cannot find the other one. With everyone else on the coach Mrs Franz escorted sockless child to his room to find the missing sock on the floor in full view. He must have done a daddy’s look not a mummy’s look said Mrs F.
Daniel obviously did not put on suncream yesterday despite several reminders from Franz and his instructor! 0730 and the mountains are cloudy although the sun is out! Drivers have confirmed we are leaving the hotel earlier than originally planned so we could be beck at school at 8.30 am not 10.30 Franz will up date later! 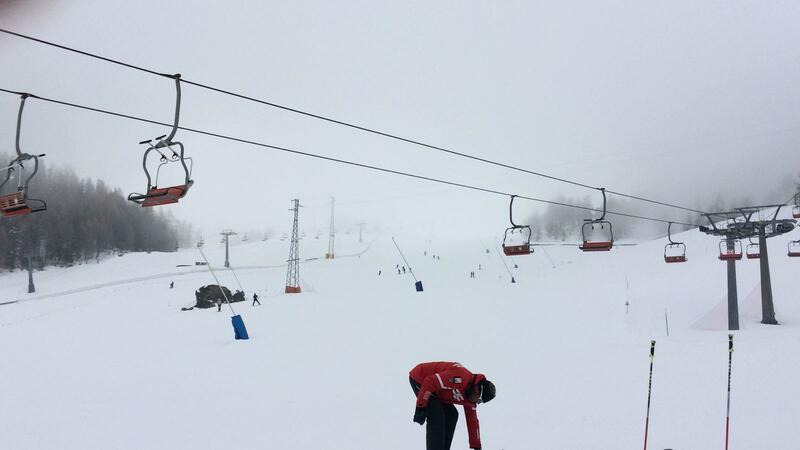 Staff have stopped for a coffee and watched the snow beginner group ski past brilliantly until Meet fell. We watched from a distance as he struggled to get his skis back on and after the third attempt Miss J skied across to help him. Meet back on his skis but the challenge now is to catch up with his group. Miss J with no helmet or gloves! MA and HH off to try to break the 100kph speed barrier. Franz and Mrs Franz on their second coffee and Mrs C drinking hot chocolate so thick the spoon stands up by itself. Mist has come in and blocked the sun! Franz and co have moved inside by the fire! Franz and staff all finished skiing and now at the Yeti waiting for the groups to return. William asking to ski the black runs today, so his wrist is all better! Staff not looking forward to watching the children pack! Some are brilliant, others not! Apparently SK has a tick list to check everything is taken home. Very impressive although she cannot find her orange school hoodie. 33 children all safely counted out and counted back! Franz is relieved! Children all showered with most putting on clean clothes. Everyone packed and rooms inspected. Nothing left in the rooms but Franz cannot guarantee it is all in the right suitcase! Coach is packed, Christophersons have arrived to collect Ella and Sienna. It will be quieter on the coach behind Franz. We enjoyed our last supper – tomatoes pasta or vegetable soup, turkey schnitzel with green beans followed by ice cream. Everyone to the loo and then goodbye to Roberto and Monica in the hotel and to Angelique our rep. Panic when we could not find one room key but it had sneaked onto the coach when no one was looking and discovered under EM. En route to the Mont Blanc tunnel watching Moana! Franz enjoyed The Greatest Showman- the first time he has seen it! Just stopped to refuel and use the toilets! Lights out, electronic gadgets away, no more sweeties. When you wake up we will be in Calais. Mrs R successfully tested the daddy look this morning when looking for the butter in the fridge…. Black runs?!?! Please no. My heart. 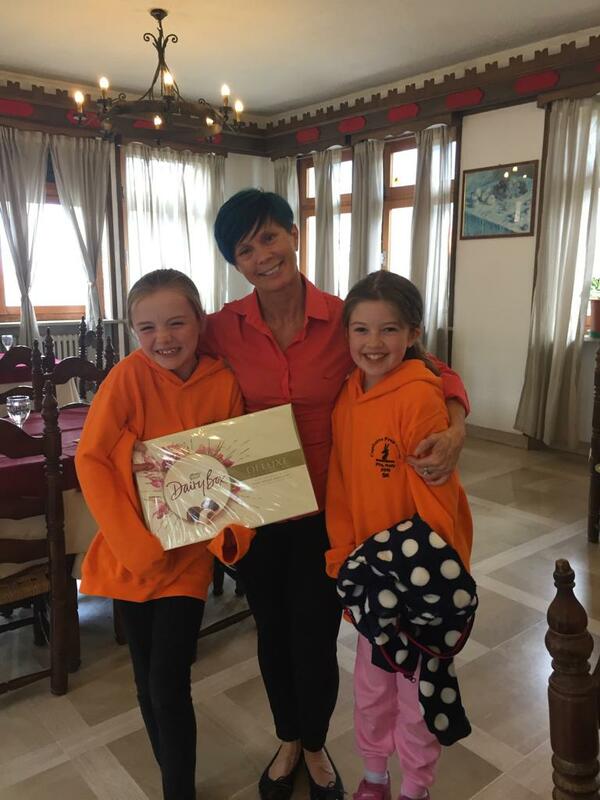 More fantastic memories made for them all thanks to the wonderful Team Franz! Word perfect on Mary Poppins by time you get to Blighty?? Is it too late to give Lewis another call? Are you arriving at 8.30 at school?